This 5 pack of replacement coils for the Aspire Breeze device are some of the highest quality, most dynamic coils on the market.These coils are easily primed by putting a single drop of E Liquid on top to moisten the center and prevent against burning. Draw activated, the innovative design will give you bold, impacting flavor and cool, refreshing vapor that will give you an exceptional vape every time. 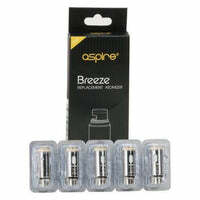 Breeze Replacement Coils (5 Pack) - Aspire has a rating of 4.9 stars based on 16 reviews.